During the presence of the Gesuati religious at Sts. John and Paul (1440-1668), in March of 1555, the Jesuit Fr. Luis González de Cámara was called to preach a retreat to Abbot Jerome Martinengo, who had been named Apostolic Nunzio. However, only with the arrival of the Vincentians in 1697, would the Celio monastery consistently host retreatants. 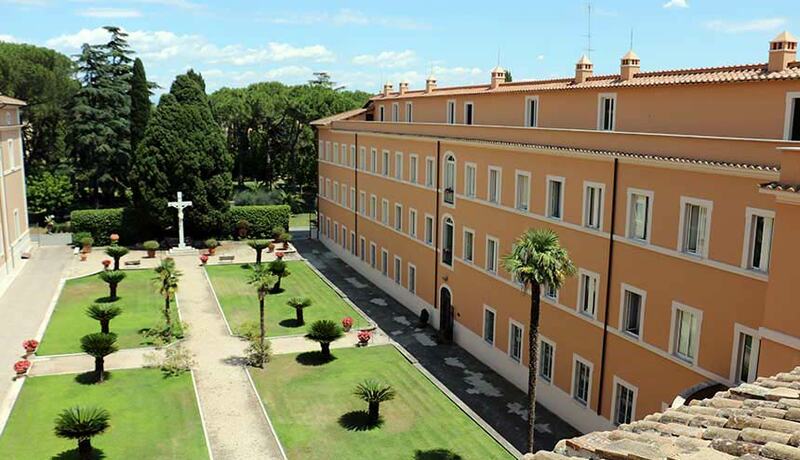 The retreats were reserved mainly for their young religious or some other students who preferred the solitude of the Celio rather than the inevitable noise of the retreat house that they conducted at the Curia Innocenziana on the Montecitorio Hilltop. With the arrival of the Passionists, on 9 December 1773, led by the Founder, St. Paul of the Cross, the Celio monastery became the Institute’s headquarters. However, the community here also performed the preaching ministries of the Congregation, both in the city and in the Roman countryside. Rooms were reserved for retreatants, which eventually included the entire floor of the northern side of the monastery. St. Vincent Mary Strambi (+ 1824), then superior of the retreat, drafted the first guidelines for the retreatants that was inspired by the Ignatian exercises in style and content. The superiors always chose the best qualified directors and preachers for this important ministry. With the restoration of the Congregation, expedited by Pius VII after the Napoleonic Suppression (26 June 1814), the ministry of the spiritual exercises on the Caelian Hill experienced a period of great splendour. Already in 1815, there were over 263 retreatants. During these years Giovanni Maria Mastai, the future blessed Pius IX (+ 1878), assiduously frequented the retreat house. The abundant surviving documentation testifies to this Passionist ministry that continued throughout the nineteenth century and into the following century, until the present day. Two blesseds in the mid nineteenth century, Fr. Dominic Barberi (+ 1849) and Fr. Lorenzo Salvi (+ 1856), preached retreats here especially during Advent and Lent-Easter. Retreats for children were offered for those preparing for First Holy Communion, which remained an indelible memory as attested to by various witnesses. Retreatants, especially in the nineteenth century, came from various lifestyles — both secular and ecclesiastical, of noble family or humble origin and occupations. They had a common desire to hear the word of God by reflecting on the Eternal Maxims and above all, by meditating on the Passion, under the guidance of experienced missionaries. The retreats were crowned by sacramental confession and Communion. A large group of Saints, Blesseds, and Servants of God took part in retreats on the Caelian Hill. Among them: St. Julian Eymard, Saint Gaspare del Bufalo, St. Anthony Mary Gianelli, Saint Vincent Pallotti and Blessed Antonio Rosmini. There were also Popes, such as the aforementioned Pius IX, and then Leo XIII, John XXIII, Paul VI, John Paul I. From the late 19th century and throughout the 20th century the retreats were gradually assigned to various categories, priests, religious and lay faithful. After the Second Vatican Council, the Retreat House was also opened to Sisters, the laity and numerous parish groups. Many ordination candidates of the various Roman colleges ascended the Caelian Hill for spiritual exercises in preparation for the various clerical orders. These include the aforementioned Saint John XXIII who transcribed his memories of his retreat in the unforgettable pages of his “Journal of a Soul”. The retreat house of the Caelian Hill, which was recently renovated, is one of the oldest in the city. Since the arrival of the Passionists in 1773, it has always served those who want to spend time in an atmosphere of silence and recollection, a powerful experience of the Spirit according to the characteristic spirituality of the Congregation of the Passion.